For Ludlum Dare 30 - "Connected Worlds"
"You represent your robo-planet government at the Great Space Ambassador Summit. 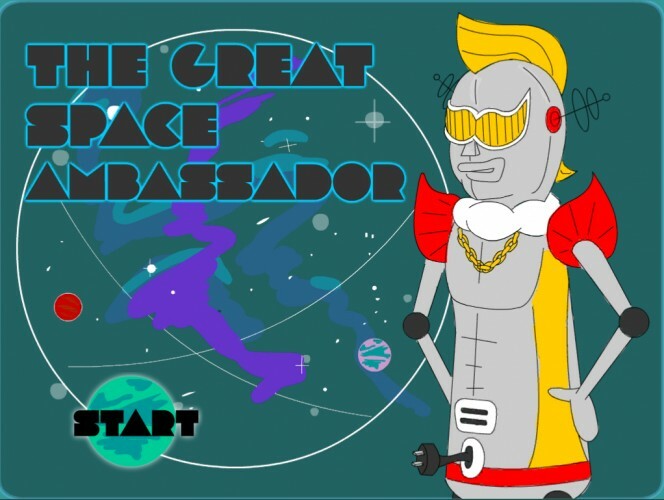 Your goal is to negotiate a trade deal with at least six of your fellow robo-ambassadors. Use the left and right buttons to move. When you encounter a robo-ambassador, offer one the resources you are holding to sweeten the trade deal. REMEMBER: THIS IS NOT A BRIBE, IT IS A MECHANO-GIFT. Fail, and you will return to your disappointed mecha-kingdom as a pitiful loser. Win, and you will have all the cyber-delicacies you can analyze! GOOD LUCK! YOU'LL NEED IT!!"